Spring is here! Are you ready for that first spring ride? Start by taking out your leather horse tack and do a "spring check" on all your equipment. The "spring check" includes cleaning, oiling, and conditioning your leather horse tack. This is vital to ensure your first spring ride is safe and enjoyable for both you and your horse. 1 Take everything apart and inspect all tack, including your saddle for wear. Especially at areas (picture 1) where your tack folds around the bits, buckles and saddle riggings. This is where there will be the most wear and stress. You need to replace any parts cracked or stretched. Chancing it is not worth the safety risk. Take your time; your peace of mind is worth it. 1 Clean all your leather tack and saddle with a generous amount of water and glycerin saddle soap. Don't be afraid to get your leather tack wet. You have to get all the dirt and sweat out. 1 Hang all tack to dry. BEFORE it is completely dry, oil with a good quality neatsfoot oil. The drying process will help carry the oil into the leather. This "spring check" is a great habit to get into, not only for adults, but for children too. Teaching your children about leather tack and it's proper care, will ensure the safety of both your child and horse. This springtime check is essential to keep your leather horse tack in good working order for the safety of both rider and horse. Not to mention, increasing the longevity of the leather. Cleaning is important but checking the durability of your leather horse tack is vital! To stop the wear on your saddle billets, use wear leathers! 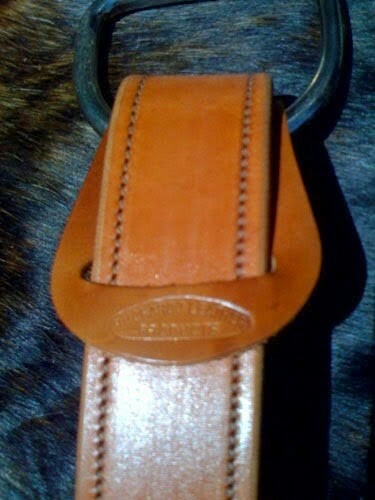 One of Buckaroo Leather's innovations is the wear leather, pictured above. They are used on all of our off side billets. The wear leather stops your saddle rigging dee rings from wearing into the billets, which can cause a stress point! Another important thing to remember, is knowing you have quality leather horse tack to begin with! A quality leather horse tack will be more durable and much less likely to crack or wear. The following will give some guidelines to follow when choosing quality leather tack. 1. Feel...Is the leather soft and supple? If it feels “dry”, it’s probably not quality. Even though “harness” leather may seem roughed out, it still has a soft and pliable feel. 2. Smell...Quality leather has a fresh warm smell, whereas inferior leather can have a chemical or ammonia like smell. Off odors are the first hint of leathers that are tanned quickly and inexpensively. 3. Color...Even when dyed, quality leather will still be pliable and smell fresh, Inferior leather seems to be “dull”. Dark color dyes can hide lower quality and poorly matched leathers. 4. Check the Detail...Examine the fine stitching, which is less than 12 stitches per inch. All ends should be neatly finished and tucked in. Edges that have been burnished or rubbed, until they are round and hard, before dyeing are also a hallmark of quality. Look for durable hardware with strong steel tongue buckles and rounded edges that won’t cut into the leather. The breast collar, or breastplate, is a piece of tack used on horses in a variety of disciplines. The purpose of the breast collar is to keep the saddle or harness from sliding back. The variation of a breastplate used for western riding, is referred to as a breast collar. The term breastplate is occasionally used, though western riders generally use breast collar to refer to both designs. Breast collars can attach to the saddle rigging or dee rings on the front of the saddle. 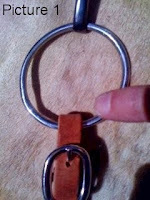 In either case, an additional strap usually runs between the front legs and attaches to the cinch. Some western breast collars also have a wither strap. The breast collar is used on both English and Western saddles. Horses in Western disciplines that involve working with cattle, use a thicker and sturdier style. The pulling breast collar harness is popular among Western riders, particularly ranchers and ropers. The pulling style breast collar sits just above the line of a horse's shoulders and buckle around the pommel of the saddle. Ranchers, ropers, and others that prefer this style of breast collar, say that pulling breast collars allow the horse more freedom of shoulder movement and better leverage when pulling. 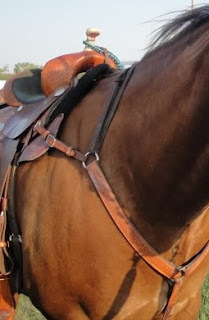 A wither strap, or an over the neck breast collar strap, is designed to go up over the withers to hold your breast collar up in the correct position over the shoulder, so as not to rub across your horse’s shoulder. Breast collars should not be fitted in any way that will restrict the horse's movement. Special attention should be paid to the shoulders, chest, and the area between the horse's front legs. A general fitting guide is that a fist should fit between the breast collar and the horse's chest, and there should be a hand's width between the wither strap and the withers. The breast strap should have some slack, and the buckle shouldn’t rub the sensitive skin in the area. It should also be adjusted so that the chest straps lie above the point of the shoulder, so that the horse's motion is not restricted. Breast collars are often tooled, embellished with conchos and personalized in many ways. 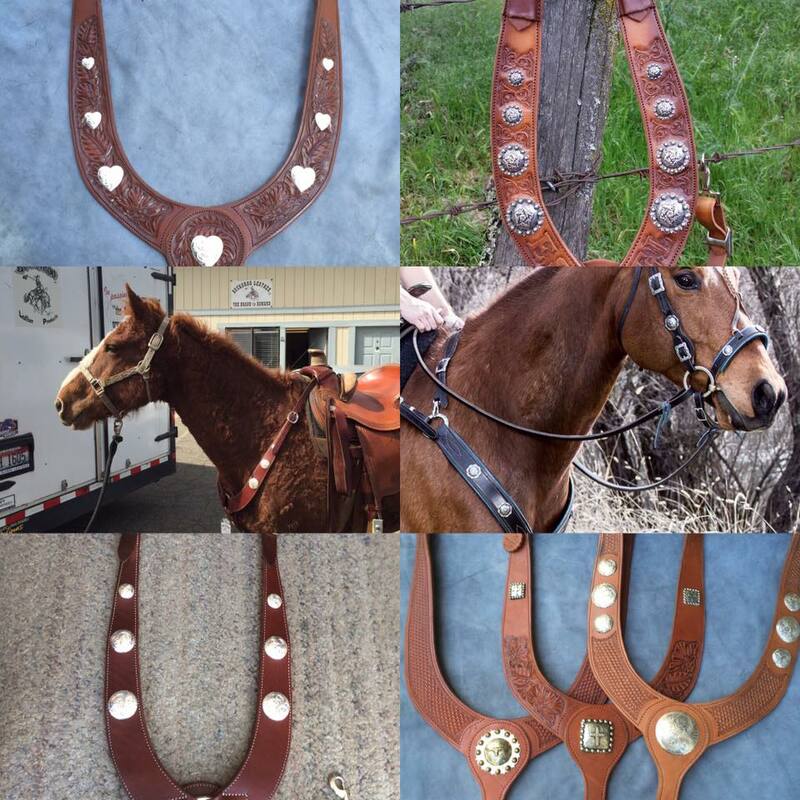 If you already have a breast collar, your existing tack can be updated and personalized. You can find our breast collars and all of our American made tack at www.buckarooleather.com . Evidence exists that the predecessor to the modern saddle was in use by the Assyrians in 700-800 BCE. It consisted of a simple cloth fastened onto the horse with a surcingle. These early saddles had neither a solid tree nor stirrups. By 300 BC, the Samaritans added a breastplate and girth to keep the saddle on. The development of the solid saddle tree was significant; it raised the rider above the horse's back, and distributed the rider's weight on the animal's spine. This change greatly increased the comfort of the horse and prolonged its useful life. The invention of the solid saddle tree also allowed development of the stirrup. Without a solid tree, the rider's weight in the stirrups creates abnormal pressure points and makes the horse's back sore. The first stirrup like object was invented in India, and consisted of a simple leather strap in which the rider's toe was placed. It offered very little support. The nomadic tribes in northern China are thought to have been the inventors of the modern stirrup. The stirrup appeared to be in widespread use across China by 477 AD. The stirrup and it’s use then spread to Europe. During the Middle Ages, the nights needed a saddle that could help hold them in place and support the weight of heavy armor and weapons. This resulted in a saddle that was built on a wooden tree with both a higher pommel and cantle, making it much harder to knock a rider off during battle. This saddle was padded with wool or horsehair and covered in leather or fabric. The American stock saddle evolved from the early Spanish Conquistador’s war saddle. The Mexican Vaqueros adapted the saddle, which had a heavy, rigid tree, high fork, high cantle, deep-dished seat, leather skirt and short stirrups. 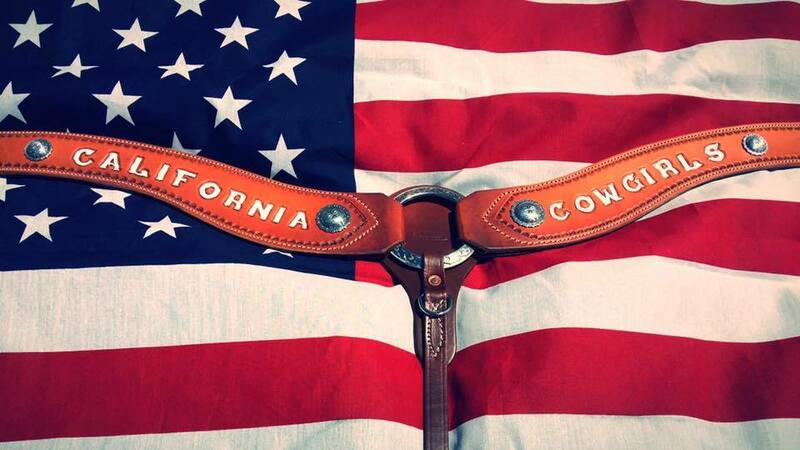 In the late 1700's, the Mexican "California" saddle came about. It had a fixed, round skirt, along with a more substantial rigging. The rigging, which consisted of a cinch ring that hung down in line with the front fork and a horizontal strap that ran from the cinch to the back of the tree, secured the saddle. The strong high-peaked pommels of this saddle were ideal for taking a turn around a rope for holding an animal. The Texans then altered the design even more. They kept the wooden tree, horn, cantle and stamped leather but they modified the wooden horn so it was short, thick and covered in leather. The skirt was changed to a plain square skirt and the stirrups were made out of wide, bent pieces of wood which were much stronger than the ones previously used. A second cinch was also added to firmly anchor the saddle. In the 1870's they changed the horn again to a short metal one, as the wooden ones often broke when dealing with a wild cow. 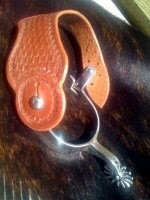 During this time saddle makers were spread throughout the west and were quite busy making and repairing saddles. Many new designs and innovations came about with the input that they received from ranchers, cowboys and the influx from the East. There were many different styles of saddles seen, the "Plantation-style", "Morgan", "Hope" and "Cheyenne" were just a few. Today, there is no end to the saddles that are designed for a wide variety of uses and riders. 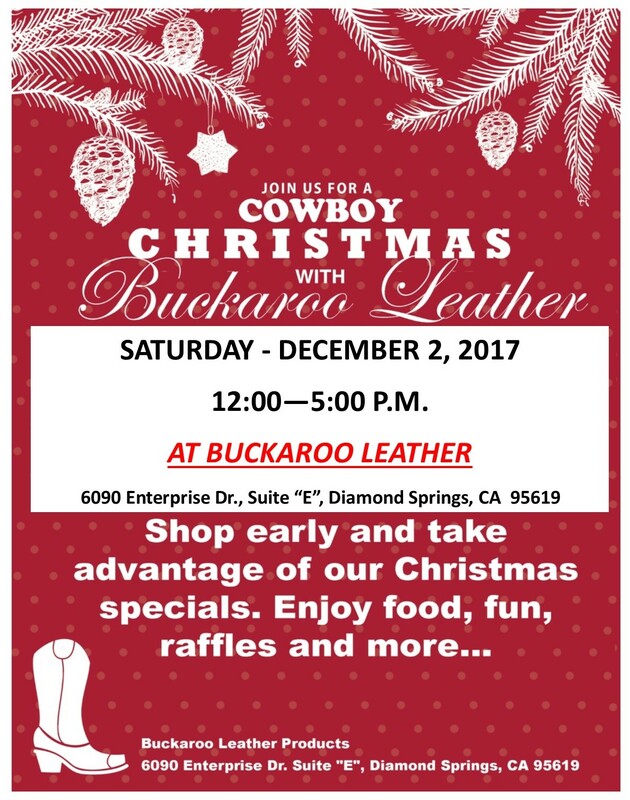 Buckaroo Leather offers quality leather horse tack for all your needs. Buckaroo Leather, The Brand to Demand!